← Trevor Hardy Awarded an MBE! 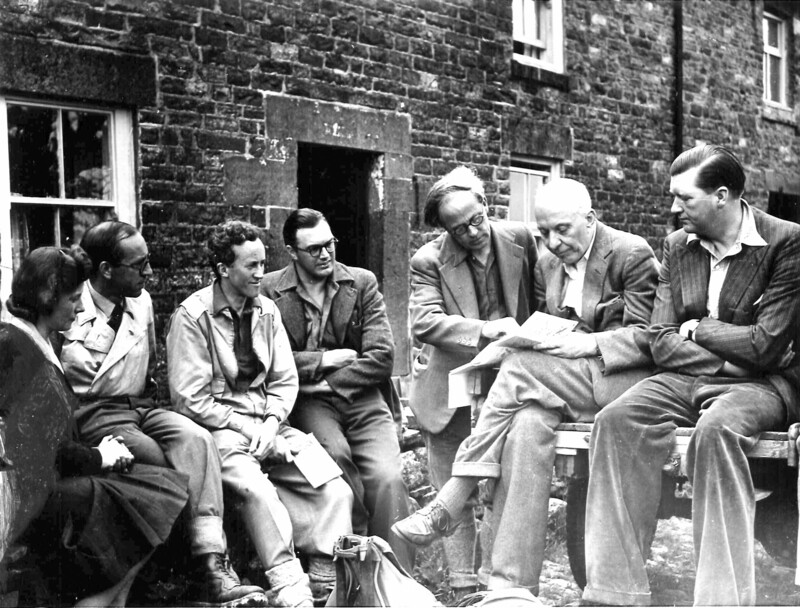 The above photograph taken at Birkdale Farm in Upper Teesdale in 1948 shows from left to right Barbara Castle (then aged 38), Fred Willey(38), Arthur Blenkinsop(37), George Chetwynd(32), Tom Stephenson(55), Hugh Dalton(61) and Julian Snow (38) planning the route of the Pennine Way. Birkdale farm is on the Pennine Way and is the last building passed when heading from Teesdale to Dufton. It was famously cut off for many weeks in the severe winter of 1947. Due to the many objections of the landowners, the Pennine Way did not actually open until 1965. Those present on this historic photograph were all senior members of the government of Clement Attlee (1945 -1951) except Julian Snow who became a MP at a later date and all went to senior positions both within and without government. Barbara Castle (MP Blackburn and later a Baroness) became the first female Secretary of State and in a later role as Minister of Transport the use of seatbelts a legal requirement, a 70 mph speed limit on motorways and brought into use the breathalyser. Fred Willey (MP Sunderland), Arthur Blenkinsop (Newcastle East and South Shields), George Chetwynd (Stockton) and Hugh Dalton (MP Bishop Auckland and who was Chancellor of the Exchequer) all represented North East constituencies, whilst Julian Snow later became Baron Burntwood. Tom Stephenson, who had promoted the idea of the Pennine Way before WW2, became the first full time paid secretary of the Ramblers Association and it was he that had gathered such an important group to survey the route. All were walkers and many held positions in the Ramblers Association as well as senior positions in various national wildlife and convservation bodies. Their efforts led in 1949 to the National Parks and Access to the Countryside Act, which has since delivered massive improvements to the general public which are now taken for granted. It is difficult to imagine such a group of senior MPs, of any political persuasion, now being assembled to carry out such an activity! Permission to use this photograph has been given by Paul Jackson, the Editor of the Yorkshire Dalesman. This fine magazine is full of interesting articles not only of the Yorkshire Dales National Park but also the North Yorks Moors National Park and much of rural North Yorkshire. In addition it keeps you informed of much that is happening in the area as well as forthcoming events and is an excellent read for all those who love this fine part of the country.